Whether you are looking for new eyewear for your little one or have just discovered your child’s apparent need for glasses, you might be feeling a bit ove rwhelmed by all of the options out there. 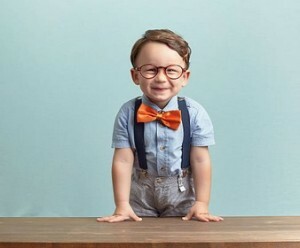 From hundreds of different frame styles to various tinting options, there is a lot to choose from when it comes to a pair of eyeglasses, and choosing for a child makes the whole process even more stressful. We all know kids are pretty rough on practically every item they own. Glasses are no exception to this rule. From sports and dance to simple playground games, a child’s glasses see a good amount of physical activity during day-to-day usage. This often leads a parent to purchase the most heavy-duty option they can find. However, this isn’t always the best option. If your little one has especially poor eyesight, they will likely be presented with some pretty thick lenses. Often, this also means bulkier frames to go along with the extra thick lenses. This super heavy combination does tend to be a bit tougher, but can also inhibit the child’s ability to run and play as they normally would due to the heavy-weight eyewear that is continuously slipping down their nose. Additionally, those younger people who require a stronger prescription are often made fun of in school and on the playground. After all, those thick lenses and bulky frames are not very attractive, and can lead to a bug-eyed look that other kids can’t help but notice. For this reason, it is recommended that the parents of children who require an extra strong prescription look into purchasing high-index eyeglasses for their little one. The reasons for investing in high index lenses are endless. However, we will review some of the more popular reasons in the list below. When it comes to traditional glasses, a higher prescription equates to thicker, heavier lenses. This in turn requires the wearer to select more durable frames. This means traditional glasses are far heavier for a person with especially poor eyesight than they might be for someone with only mild visual impairment. Unfortunately, very heavy glasses are not very comfortable. Children who own incredibly heavy glasses are more likely to develop sore spots where the glasses rest on their faces. Additionally, these kids are less likely to wear their glasses as often as they should, leading to worse vision issues later in life. There is no arguing the fact that kids can be mean. Some kids will take every chance they can get to bully and make fun of other children, and heavy glasses with thick lenses are the ideal opportunity for these kids to tease and make fun. 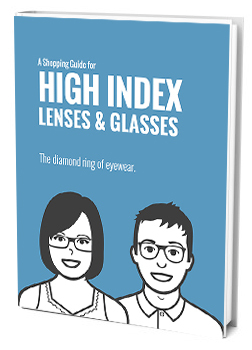 High-index lenses can provide the same eyesight correction while remaining thin and sleek. This removes the bug-eyed look so many children poke fun at and leaves the child feeling more confident and attractive. If your child’s glasses are heavy, it only stands to reason that those glasses will be more prone to slipping down the young person’s face. Not only is this annoying, it can also lead the wearer to practice improper eyeglass usage. When glasses slide on a regular basis, they tend to become stretched out over time. This stretching makes the glasses fit differently than what was originally intended, generally placing them further down in the nose. Improper fit can cause the wearer to damage their vision further as they strain to see with their glasses in the wrong place. Additionally, it can cause frames to break due to warped arms and hinges. Fortunately, high-index eyeglasses solve all of these problems by outfitting the young person with lightweight glasses that offer them all the vision correction they need. As we mentioned before, if a person is wearing thicker, heavier lenses, they will need stronger, bulkier frames to go along with them. This significantly reduces the number of choices they have when it comes to frames. Because picking cute or cool frames is one of the best parts of purchasing a pair of glasses as a child, this is incredibly sad for those children who do require a stronger prescription. With high-index lenses, this is never a problem. The light weight of these lenses makes them easy to put into virtually any frame, opening up a whole world of options for those with poor eyesight. While high-index lenses are definitely the best options for young people in need of strong prescriptions, it is important to note that these lenses are a bit more fragile than the average lens. However, by helping your child understand the importance of caring for their eyewear and giving them the information and tools they need to do so, your little one’s high-index eyeglasses will get plenty of use before needing to be replaced. Below are a few tips for keeping your child’s glasses in tip-top condition. A child should always be given a hard case to store their glasses in. Foregoing the case—or opting for a soft case instead—is just asking for trouble, so be sure to budget the tiny bit extra to get a quality hard case when placing your order. Another great accessory that can really help extend the life of your little one’s glasses is a strap. While an older child probably won’t need this for everyday wear, it can be incredibly helpful for those active days at the playground. They are also good for very young children who are just getting the hang of wearing glasses. Are you raising a little athlete? If so, you’ll probably want to keep two pair of glasses on hand. High-index glasses are perfect for everyday use, but due to their fragile nature, a second pair of traditional glasses with heavy-duty frames should be kept in your little sport’s star’s bag for practices and games. This will keep their more expensive high-index glasses from becoming damaged, while also allowing them to see while playing. Keeping glasses clean is an important step toward lengthening their life. Therefore, you will want to teach your child proper cleaning techniques and provide him or her with a soft, lint-free cloth to carry with them for wiping purposes. Be sure they know to stay away from cleaning products and instead stick only to warm water when cleaning their eyewear. If the glasses are especially dirty, mild soap may be used as well. Additionally, it is a good idea to remind your child to clean their glasses after every trip to the beach or when they have spent significant amounts of time outside. Sand and dirt can be very damaging to glasses if left to sit, as it tends to scratch the lenses, leaving permanent scuff marks. Are you looking for some amazing high-index eyeglasses for your kid? We would love to help! We offer a number of frame and tint options, and can fill the needs of almost anyone. Have a look around our online store today and start your search for the perfect pair of high-index glasses.